Every dish that is covered with golden onions somehow just makes me feel at home. And if someone has mastered the onion, it’s probably the French! They just know how to make some really impressive and delicious food showcasing the humble onion! No matter if it’s a crispy tarte flambée, a creamy French onion soup or a nicely seared piece of meat slathered with golden onions – there can almost never be too many onions in a dish! They are the perfect base for so many dishes, sauces and almost anything savoury. Many of my dishes therefore also start and end with onions. Diced white onions will kick-start your stir-fry, raw red onions will give you a nice fresh crunch, and sliced spring onions make for a perfectly fresh and colorful garnish. Onions and cream go amazingly well together! Simply add the taste of lamb and some potatoes in order to end up with an instant comfort food classic! 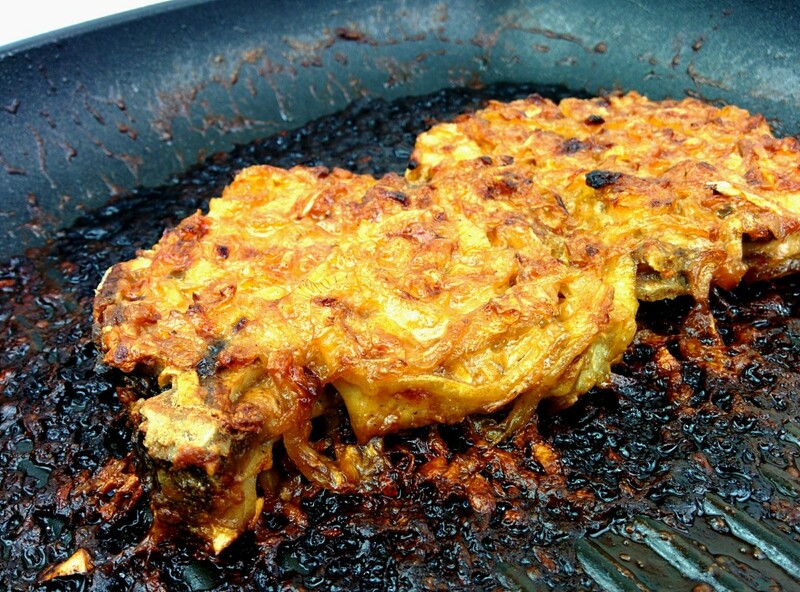 I usually prepare these creamy onion baked lamb chops whenever I crave that warm feeling of home. The savory and melting onions combined with the richness of cream somehow just create that mood of tradition and comfort. Prepare these impressive oniony lamb chops in minutes, your oven will do the rest! I am using a little shortcut again – French onion instant soup! So next to the melting fresh onions, you will also have the depth of the onion soup. This will give your chops an even richer taste. Bake some oven potatoes along the way to have a complete comforting meal. The potatoes will need about 1 hour in the oven, the lamb chops only 45 minutes. So start with the potatoes, bake them for 15 minutes and make the chops in the creamy onion sauce in the meantime. I usually use a grill-pan for the searing of the lamb chops as for the baking in the oven. Not only is it one less dish to wash up, but it also makes sure that nothing of the taste goes to waste. Oh and don’t mind the ‘burned browned stuff’. It’s the completely reduced down onions around the chop. Have a nibble and tell me that this is not still delicious! Put some olive oil with a little salt in a small bowl. Roll potatoes in the salty oil so all sides are covered. Bake potatoes in the oven for 15 minutes. While the potatoes start baking, get busy with your chops! Season some flour with salt, pepper and red pepper flakes. Dust the lamb chops with the flour, shake the excess off. Peel and slice the onions. Sear the lamb chops in a very hot pan with some oil on both sides. Just sear them nice and brown – no need to cook them through. Transfer chops to a plate and set aside. Reduce the heat of the pan, add a splash more oil and fry the onions until golden brown. Add the cream, 100ml of water and the onion soup powder. Give a stir and simmer for 5 minutes. Put the lamb chops into an oven-dish or casserole and top with the creamy onions. Place the dish in the oven alongside the potatoes, reduce the heat to 175°c and bake for about 45 minutes. Check after 30 minutes how browned the onions are. Cover with aluminum foil if needed. Plate your creamy and incredible lamb chops with the fluffy potatoes, get cozy and dig in! Let me know in the comments what you think of the recipe! Do you consider onion soup powder as ‘ingredient’ a big no-no? And what’s your favorite onion dish anyway? All your comments are welcome!